Cleddau is on an Autumn cruise. 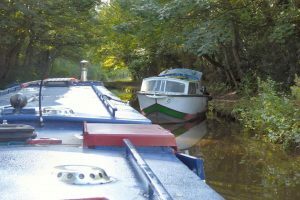 It’s a one-way trip: she’s off to spend the winter at Aqueduct Marina (near Nantwich) where she will be sand blasted (ouch!) and repainted. She’s going early while the weather is reasonable and before winter lock closures affect the Macclesfield Canal. This boat trip is more a project than a holiday cruise. Stuff (boaters, you know about stuff that accumulates on boats) has to be removed to allow clear access to the hull. Already the house is filling up with boat bedding and the contents of the bookshelves, while into the garage is being squeezed poles that need painting, non-essential engine room equipment and paint pots galore… Meanwhile, on board, breakable stuff (much of the contents of the shoulder height glasses and mugs cupboards) has been slimmed down, the bulk of it wrapped and packed in the lockers below the dinette sofa. This project is an exercise in logistics: two cars were driven from Bedfordshire to Aqueduct Marina (M1, M6, M6 Toll, M6…) then one car continued across Cheshire (hallo, why that’s a close pass of Jodrell Bank) to Higher Poynton via Macclesfield (which allowed a half hour catch up with this week’s news from The Cheshire Three). It was a glorious day, cloudless, windless – just the best sort of day for moving a narrowboat. “Not a bad day…” nodded the chap washing a Braidbar boat, moored beside the towpath. Three minutes into the start of the cruise there was a delay; slowly, slowly, slowly a boat was being turned just in front of Bridge 15.
again to be greeted with ”Not a bad day…” The sun was shining, the wind wasn’t blowing, the rain wasn’t falling and, in striking British understatement, it wasn’t a bad sort of day…! and more signs of a thriving operation at Bollington Wharf. very convenient for a dash up Buxton Road to a nearby Co-op store). and a near collision at the Broadhurst Swing Bridge (blind approaches from both directions). circling and swooping, before one flock lowered and lowered, coming in to land, to graze, clear of the cows and sheep. Onward, through Broadhurst Swing Bridge (still left open) to the Oakgrove electrified swing bridge. Road traffic was busy; were any of those nine car drivers held up by the operation of the bridge quietly fuming at the delay? Who knows…? The warmth leeched out of the sun and by late afternoon there was a chill in the air. About five hours after departure the moorings above Bosley hove into view. And with sight of the hill mass of The Cloud directly ahead who wouldn’t want to moor up here? of the inland waterway systems.